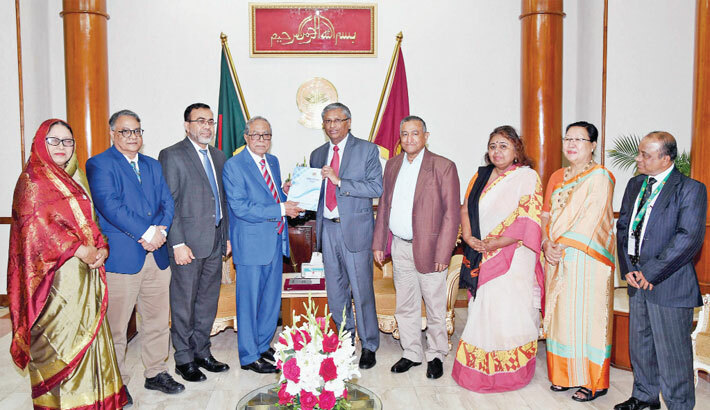 President Abdul Hamid on Tuesday urged the National Human Rights Commission (NHRC) to take prompt measures for resolving human rights-related complaints, reports UNB. He said this when an eight-member NHRC delegation, led by its Chairman Kazi Reazul Hoque, submitted its annual report-2017 to the President at Bangabhaban. President Abdul Hamid asked NHRC to take quick measures to solve the cases, President's Press Secretary Joynal Abedin told UNB after the meeting. The President told the commission that it will have to be more alert to respond to any complaint at the shortest possible time, the press secretary said. NHRC Chairman Reazul apprised the President of the different activities of the commission. He said they received 644 complaints in 2017 and resolved 356 of them. NHRC sent the remaining complaints to other authorities concerned for resolving them.